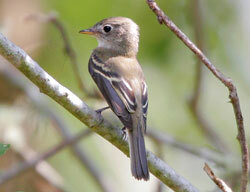 Notes by Susan Billetdeaux: The Least Flycatcher is one of the confusing "empids": small flycatchers with wing-bars who are all very similar in appearance. Other empids include Acadian, Yellow-bellied, Alder, and Willow. They are best identified by their songs and call notes. The song of the Least Flycatcher is a snappy che-beck, with the accent on the second syllable. It is often repeated multiple times. The call note is a dry whit. Least Flycatchers are usually found fairly low in bushes. Greatest numbers occur in May and August through mid-September. Comments by Don Verser: Least Flycatchers are the same small size and shape as Yellow-bellied Flycatchers but generally more whitish overall. Leasts are fairly vocal and give a soft "whit" call note.